The Bureau of Labor Statistics released this morning its regular monthly report on employment and unemployment. There will be one more such report on Friday, November 2, but this will be just a few days prior to the November 6 election. The current report will likely be more heavily scrutinized, and commented upon, in the period leading up to the election. The report indicates that while employment growth in the US remains positive, it remains sluggish. The estimate is that total employment rose by 114,000, of which 104,000 were private jobs, and 10,000 were government jobs. While positive, this is less than the estimated 200,000 to 250,000 new jobs required each month which this blog has indicated in an earlier post needs to be sustained for unemployment to fall on a consistent basis. This estimate of 114,000 new jobs is less than the revised estimates of net new jobs created in July and August. All the estimates are preliminary for the most recent two months, as the BLS revises the estimates as new numbers come in through the regular reporting system. The July and August net new jobs estimates were revised upwards to 181,000 in July (from an estimate of 141,000 last month) and to 142,000 in August (from an estimate of 96,000 last month), for a net addition of 86,000 jobs over these two months over what was estimated before. Almost all of the revisions were in the figures on government jobs, to growth of 18,000 in July (versus a decline of 21,000 estimated before) and growth of 45,000 in August (versus a decline of 7,000 estimated before). But government jobs remain depressed: Despite the recent growth, as of September 2012 there were 575,000 fewer government jobs than when Obama took office in January 2009 (mostly at the state and local level, as they account for 87% of government jobs in the US). 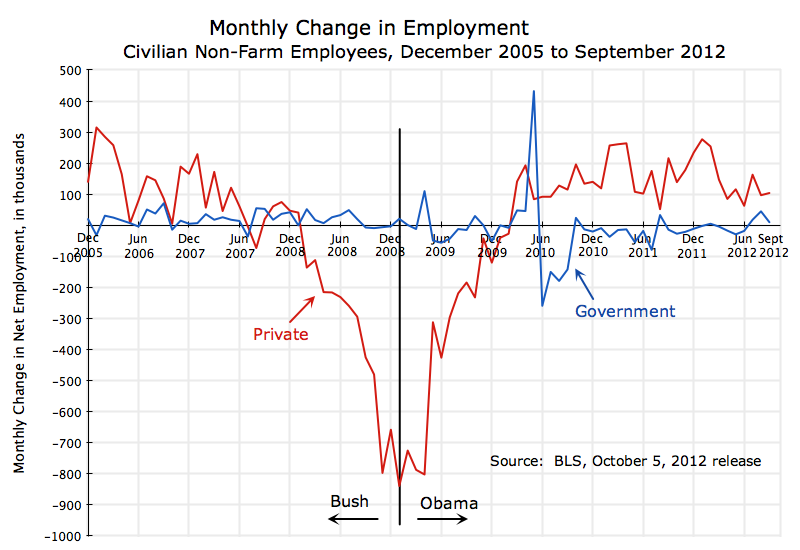 As this blog has noted before, if government jobs had been allowed to grow in the downturn following the 2008 collapse as they had in previous downturns (including in particular when Reagan was in office) or as they had when Bush, Jr., was in office, we would now be at, or close to, full employment. Despite the disappointing growth in total jobs in September (of just 114,000), it is interesting and encouraging that the estimated unemployment rate fell sharply, to 7.8% from the previous 8.1%. How could this be? It is important to remember that the estimated employment figure comes from a survey of about 140,000 business establishments (including government agencies and non-profit entities), while the unemployment estimate comes from a separate survey of 60,000 households. There are significant differences between the two surveys, both statistical and conceptual. Statistically, they are both estimates taken from samples. Conceptually, they measure different things: The household survey asks the household if they (and other household members) are employed, including as self-employed, as unpaid family labor, as private household workers, or in farm work. The business survey excludes farm workers, and the others (the self-employed, etc.) will be excluded as well as they are not employed in business establishments. But if a person has two jobs, the business survey will count them as holding two different jobs, while the household survey will merely record them once, as employed. Bearing this in mind, it is still interesting that the household survey estimated that the number of employed jumped by 873,000 in September (the biggest such jump since 2003), while the business survey only estimated an additional 114,000 were employed. Analysts generally discount the employment estimate from the household survey, as it is subject to greater statistical fluctuation (due not only to the smaller sample size, but more importantly since the business establishments surveyed will have many workers generally, while households will generally have only one or two workers). The household estimates bounce around a good deal more. But still, a jump of 873,000 employed in one month is a lot. In part, this was a bounce back from estimated negative growth in the number employed in the household survey in July and August (of -195,000 in July and -119,000 in August). It also suggests that the creeping up of the unemployment rate in recent months (from 8.1% in April, rising to 8.3% in July) may have been an aberration. The 7.8% rate of September indicates a return to the previous trend. And the 7.8% figure may have some political significance as that was the unemployment rate in January 2009 when Obama took office, although rising rapidly at that time until the stimulus program and other measures were able to turn it around. There are also indications that the recent employment estimates from the business establishment survey may have been low. First, there was a BLS announcement on September 27 that the preliminary estimate in its regular annual re-benchmarking analysis was that employment in March 2012 was 386,000 higher than previously estimated. This will be further analyzed still, and the employment figures shown above do not yet reflect this new estimate for the benchmark. Re-estimated figures for 2011 and 2012 will be provided, as they always are, when the January 2013 employment report is issued on the first Friday of February. With the new benchmark estimate, they will show that employment levels, as well as employment growth, has been considerably higher in the latter part of 2011 and into 2012 than is being currently estimated. Second, one can compare the estimates on the growth in the number of employed from the household survey to the number of employed from the business survey. As noted above, the two surveys measure slightly different concepts. But over time one would expect that they will move together, with the ratio of one to the other close to constant, although with month to month volatility. A reasonable time span to look at would be the averages over a year, such as between September 2011 and September 2012. Over this time period, the household survey indicated employment grew by an average of 238,900 per month, while the business survey indicated employment growth of just 150,500 per month. Once the new, higher, benchmark is incorporated into the business survey employment figures, the employment growth estimate from the business survey will move towards the higher figure suggested by the household survey. One can also calculate what employment growth as measured in the business survey would have been in September 2012, if the ratio of employment as estimated in the household survey to employment as estimated in the business survey (keeping in mind they are measuring somewhat different things), was the same in September 2012 as it had been in September 2011. If it were, one can calculate that employment growth as estimated by the business survey would have been an average of 223,400 per month over that period. There are therefore indications that employment growth over the past year has been stronger than the current estimates from the business survey indicate. It looks like employment growth over the last year might have averaged between 200,000 and 250,000 per month. As noted above, growth in such a range is consistent with a falling (although slowly falling) rate of unemployment. And the unemployment rate did indeed fall slowly over this period, from 9.0% in September 2011 to 7.8% in September 2012, or an average of 0.1% point per month. There is therefore some evidence that employment growth in 2011 and so far in 2012 has been somewhat higher than currently estimated. It has been high enough to lead to a fall in the unemployment rate to the current 7.8%. But this progress is still disappointingly slow, as drag from cuts in fiscal expenditures (including for government employment) has held back the economy. This entry was posted in Labor and tagged employment growth, government employment, job creation, jobs, private employment, unemployment by aneconomicsense. Bookmark the permalink.